If you have been reading my Crystal Coast Blog for very long you know I am a social media junkie, real estate marketing consultant and blogging addict. Part of my job includes consulting with real estate agents all over the US and Canada. 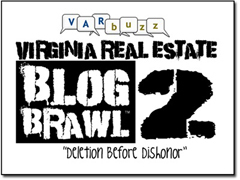 Recently one of my clients entered his Charlottesville real estate blog into a blog competition sponspored by the Virginia Association of REALTORS®. The premise of advancing from round to round is based on popular vote. The vote is open to anyone. I’m happy to report Brian Chase’s C’Ville blog has advanced to the 3rd round. Creativity Propels the C’Ville Blog into Round #3! During the initial round of the VAR Buzz Blog Brawl, Brian playfully “bribed” his way from round #1 to round #2. With the stakes raised for round #2, Brian crafted a masterful plan contributing $1 for every vote for his Charlottesville Blog to the Toys for Tots in Charlottesville ($200 max contribution). By crackie it worked! Now Brian’s C’Ville Blog is in round #3 of the competition. Our firm was so impressed with Brian Chase’s commitment to give $1 per vote last round, we agreed to match his contribution for round #3. That means each vote that is cast for Brian Chase (C’ville Real Estate Blog) we will donate $1 to Toys For Toys (max of $200)! To make this Christmas season brighter for a boy or girl, I ask you to cast a vote for our client’s blog. You’ll need to hurry and cast your vote for Brian’s C’Ville Real Estate Blog before the Tuesday 2PM deadline. You can visit the VAR Buzz blog or vote using the form below. Thanks for making this holiday season a little brighter for those less fortunate! Fill out my Wufoo form!